A friend of mine was supposed to visit us and the minute I received the call, I started cleaning the house frantically. Dusting, cleaning, washing everything was done. Everything including my son’s ears were cleaned. Harry’s cousin, our Guinea Pig3 for a short period, made a comment that we, ladies, clean up the house like crazy before someone visits. Once the guests arrive, there is always a statement that ‘Oh, please don’t mind the house, its a little bit messy. I didn’t get much time to clean it’. True, how true! I have said it many times and I have heard it many times. I was in no mood to make an elaborate meal after all the cleaning. So an all in one easy one pot meal. 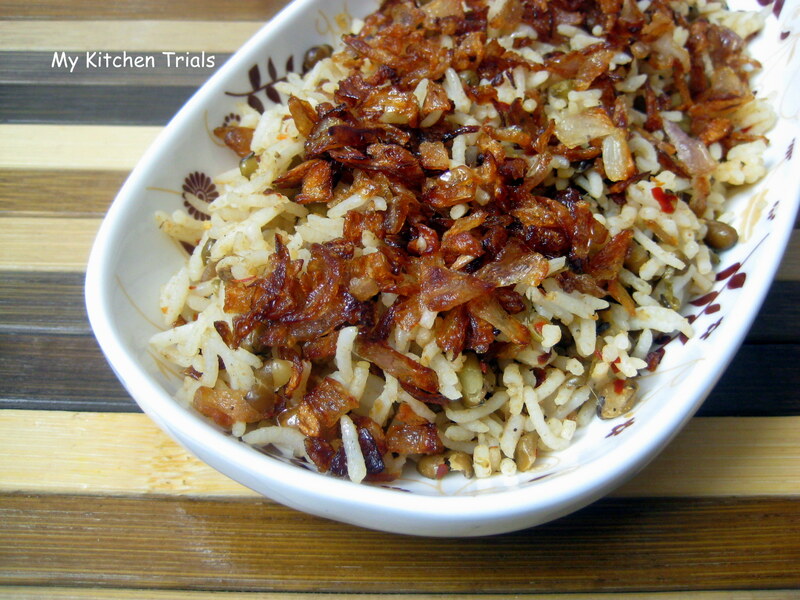 I found the recipe in Aparna’s blog and followed it as such, except for the choice of lentils. Harry, who is not a great fan of lentils was raiding the refrigerator for the left overs. 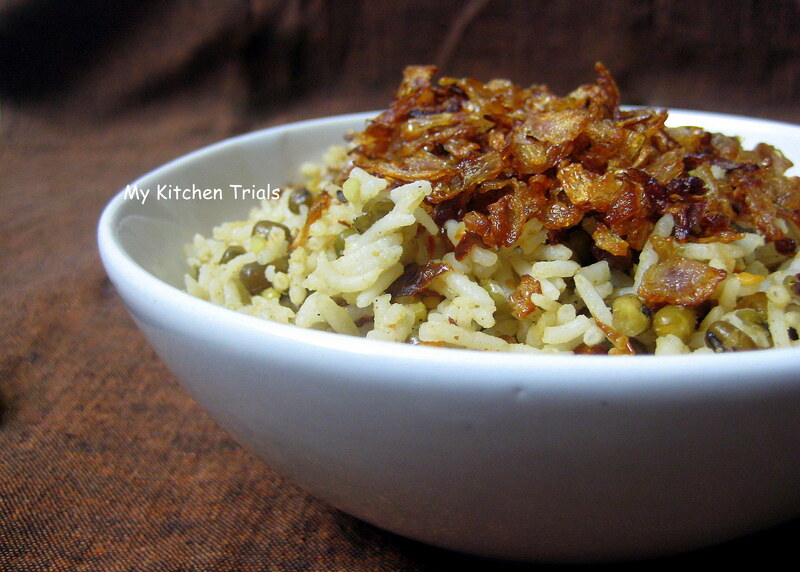 Cook the lentils and rice (in three cups of water) separately till cooked, but not mushy. I pressure cooked these, using separators, for two whistles. Heat oil and butter, add the onions and fry them till they are brown. Stir frequently to avoid burning. Once they are brown, drain them in a napkin and keep aside. In the left over oil in the pan, add ginger garlic paste and cook for a minute. Add cumin powder, garam masala, salt followed by half of the fried onions, lentils, chilli flakes and rice. Gently mix everything together and turn off the heat. 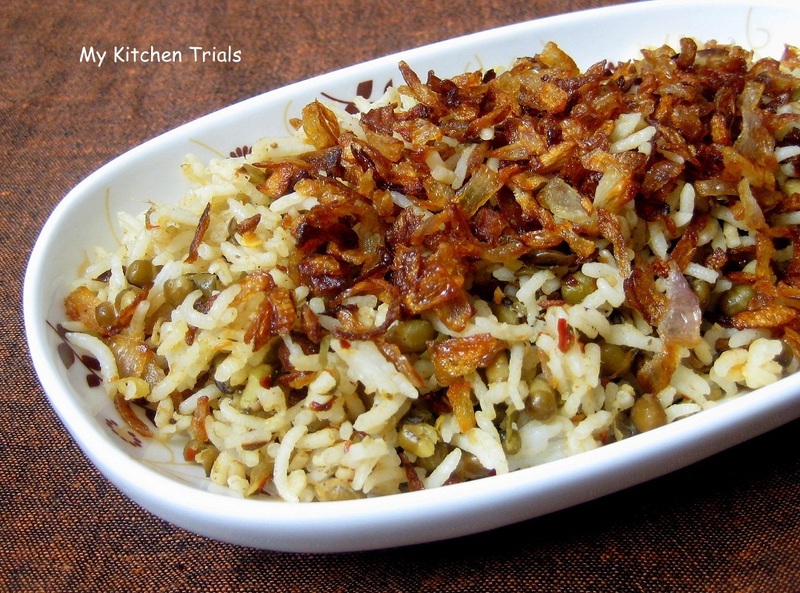 Transfer to a serving dish and sprinkle the rest of the fried onions and chopped coriander leaves on top. Serve with plain yogurt or raita. The rice tastes even better a day after making it. For making thick yogurt to go with this, I used a coffee filter without the plunger. I let the yogurt sit in the filter for about half an hour and drained out the whey from the bottom portion. The yogurt came out pretty thick. So that is going to be my Yogurt Cheese Maker from now on! My Legume Love Affair(MLLA) started by Susan. Looks pretty good. It is easy to make and I’m happy you liked it as much as we did. Healthy and delicious recipe,looks so inviting. don’t we all love one pot meals for their simplicity and also they taste wonderful! wow, looks superb and one pot meal too. Thanks for entering this into bookmarked event. We have changed rules a bit and please go through them. From now on, re-writing someone’s recipe is not allowed and only a link needs to be posted in your post with all the modifications or tweaks you made to the recipe. Please make appropriate changes to your post with respect to these rules. In Lebanon we make a mujaddara that is more like a porridge; this version is lovely as well. wow this one is perfect one pot meal..